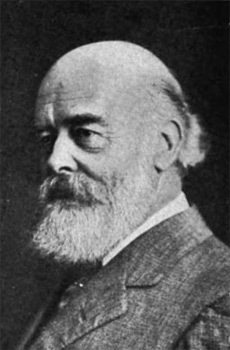 Oliver Lodge was a British physicist and author, the first principal of Birmingham University, and one of the pioneers of radio waves and radio communications, for which he was knighted in 1902. He investigated electromagnetism and lightning, and perfected and named the coherer, the radio-wave detector used in the early days of wireless telegraphy. He supported the (correct) belief that the Sun might be a source of radio waves. After 1910, Lodge became increasingly involved in attempting to reconcile science and religion, which led him into a serious investigation of psychical phenomena. His books include the spiritualist The Survival of Man (1909) and the more scientific Atoms and Rays (1924).